The BioBuilds collection of open-source bioinformatics tools is curated, maintained, and supported by L7 Informatics Systems. By including all supporting libraries, BioBuilds eliminates the need to maintain and build custom versions of these tools and enables reproducibility by providing a reference point that ensures collaborators are all using the same versions of tools. 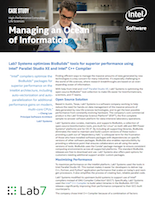 Managing massive amounts of information in an efficient way is a common problem in life sciences, so L7 Informatics Systems has partnered with Intel® to utilize Intel Parallel Studio XE to optimize the BioBuilds™ tools for superior performance. L7 Informatics used the tools in Intel Parallel Studio XE to maximize performance on the Intel64 platform; make it easier for developers to deliver top C++, Fortran and Python application performance that scales; and simplify the process of creating fast, reliable parallel code. Specifically, L7 used the Intel® C++ Compiler to build select binaries in the BioBuilds 2017.05 release―significantly improving their performance compared to their GCC-built counterparts. L7 is making the bioinformatics tools optimized using Intel’s compiler freely available. “This reflects L7 Informatics Systems’ commitment to supporting open source in bioinformatics and provides users access to pre-built, higher-performance binaries they would normally not have access to,” said Cheng Lee, principal software architect at L7 Informatics Systems. Paid support contracts are also available for users who need additional support and/or custom packages. Intel® provided funding and Intel Parallel Studio XE licenses to L7 Informatics Systems for this open source project. L7 Informatics Systems continued to use the Intel compilers to build performance-tuned packages for the 017.11 release and plans to use other Intel Parallel Studio XE components to further improve performance. Download the full case study and learn more about BioBuilds here.